For those of you who have already been to Japan, you may have experienced that trying to shop with your credit/debit card can be a little difficult! Although Japan is a bustling city with sights to see and must-have items, you realize that running out of cash can put you in a total slump! Carrying around foreign credit cards with the commonly accepted labels such Visa, Mastercard, etc. are normally accepted in Japan. However, smaller stores or restaurants may only accept cash. Now, let’s say you have your card and you do have some cash. But the problem: It’s foreign cash. You’re not sure where the closest currency exchange shop is or what time the bank closes. What do you do?! 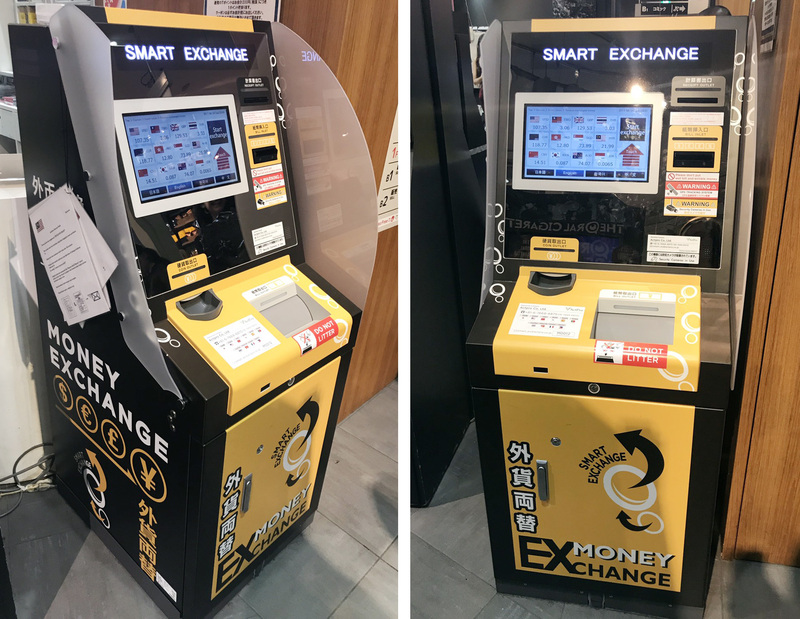 A quick and easy way to exchange your cash that I found out is to use the “Smart Exchange” currency exchange machines! So far, they accept 12 different types of currencies and are easily found at these popular stops: Shibuya, Shinjuku, Akihabara, and Asakusa. The machines are very user friendly, equipped with different language options and have decent exchange rate values! There are no confusing exchange rate charts and the money is instant. It’s almost like an ATM, but scratch out PIN numbers and huddling up too close to the machine. The machines are also conveniently located only a few minutes away from the station. Although some may be a little harder to spot than others. 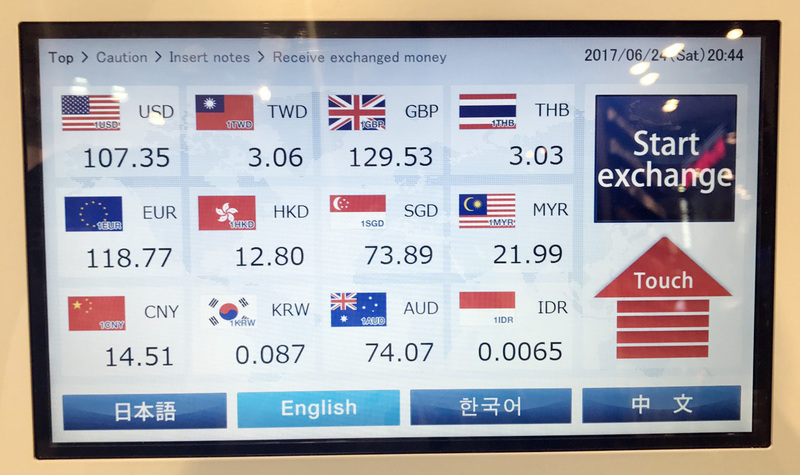 A photo of the machine's screen, showing currency and language options. For example, the machine in Shibuya. Amongst the crowds of people and city lights, it could be easy to miss. In fact, it’s not even outside! It’s inside the Tsutaya that’s across the Shibuya Crossing. Meanwhile, Akihabara’s Smart Exchange machine is located a few minutes outside the station. If you exit from the Central Gate of Akihabara Station and turn right, it’s a 1-3 minute walk before you’ll start seeing some signs leading you to the machine! I’ve never been to the ones in Shinjuku and Asakusa, but here are some resources that could help you if you're around those areas! I've also included short directions for you to refer to while looking at the map. Wait! Watch out for closing hours! As convenient as these machines are, they could have different closing times depending on how much people use them and where they’re located at! I’ve been able go to Shibuya’s Smart Exchange at around 10PM(as Tsutaya closes at 2AM). But the latest I’ve used the Akihabara Smart Exchange is 8PM. Although the links I mentioned above list operating hours, those times could be subject to change, again, depending on use and location, and other miscellaneous reasons. Overall, the machines are able to operate in the morning until later in the evening. For those going out later in the evening, be sure to calculate travel time! You don’t want to head out then find out that operating hours are over! Have a great day shopping in Tokyo folks!